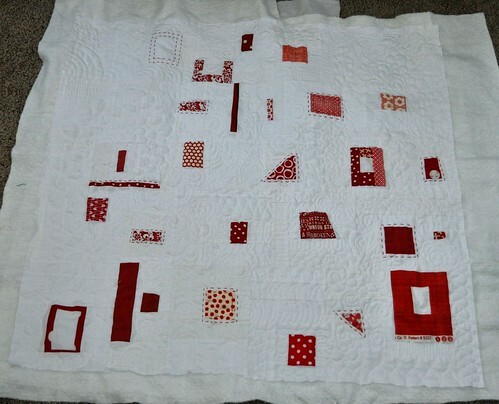 I finished up my red and white quilt for the Seattle MQG Binary Challenge a week and a half ago. 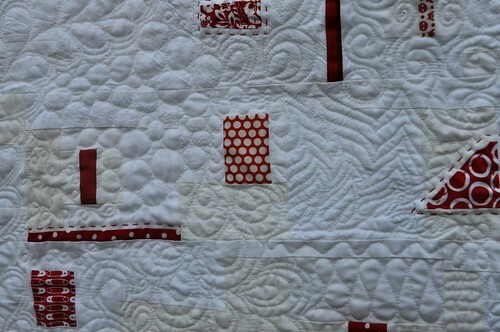 For binding, I used a white fabric that has textured dots for the binding. 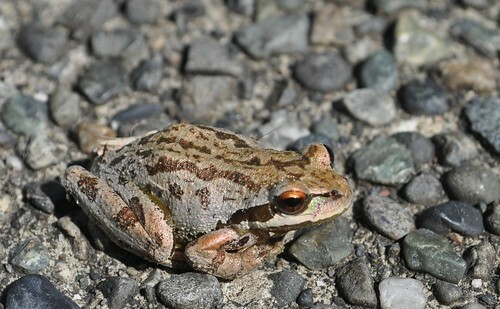 With three tiny red segments on the left. 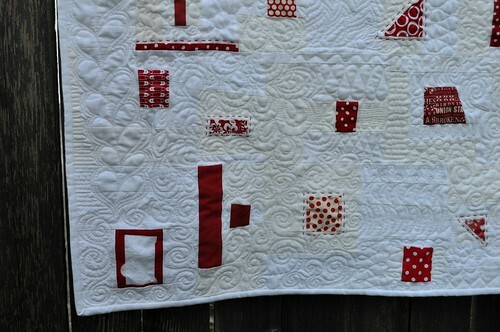 I added some more red hand quilting after I took this photo. 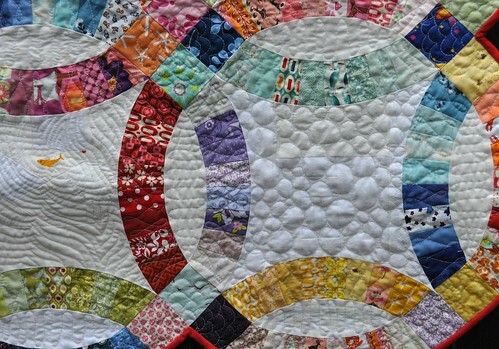 The binary quilts will be on display at Island Quilter in January; I'll let you know as soon as I find out the exact dates. The winner of my giveaway was #97, Heather. I've already sent her magazine on its way. Twice a year, the folks at Sew, Mama, Sew host a big giveaway day, where lots of sewing bloggers give away sewn items or sewing supplies. 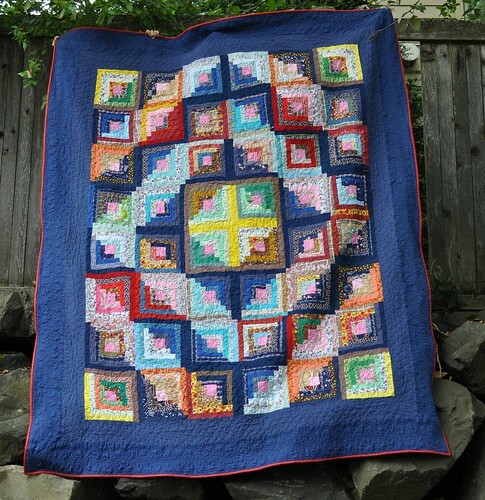 This time I have a copy of the newest issue of Modern Patchwork to give away. 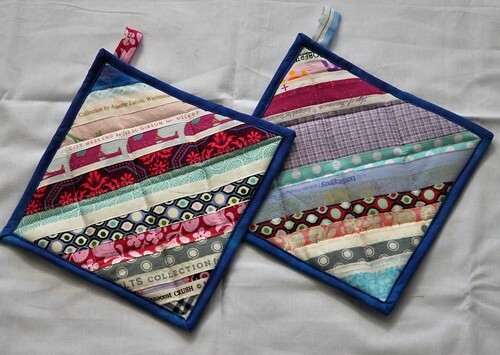 This issue of Modern Patchwork has instructions for a pillow I designed. 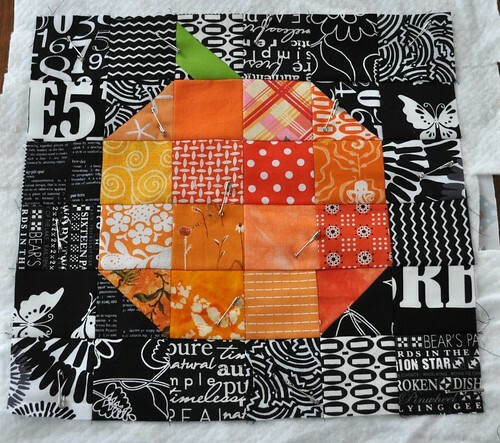 I still think the block would look good made up into a quilt... maybe someday. This giveaway is open to anyone living on planet earth. The giveaway will be open until December 13, 2013 at 5 p.m. PST. I'll notify the (randomly chosen) winner by December 15, 2013. Good luck with all the giveaways! Hi everyone! I hope you had a good Thanksgiving. We got together with a group of friends and had a great time with delicious food. And games and movie watching too. It's been nice to have a little vacation and some extra sewing time. 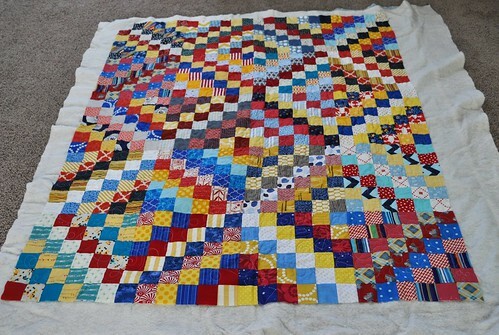 I spent most of the last two days working on my quilt for the double wedding ring challenge put on by NYC Metro Mod Quilters, and got it finished around 9 p.m. last night. It's another project made almost entirely from my scrap bags. Sewing all those curves was not easy. I did a lot of pinning. At the beginning, I had to unpick small sections on almost every curved seam, but I got better at it as I worked through the project. I used the Simpli-EZ double wedding ring template and I have a couple questions about it if there are any experts out there reading this. 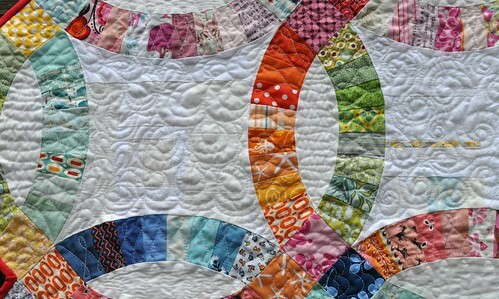 First, I had to change my machine settings to increase my seam allowance a bit so the pieced arcs would fit the little melon pieces. 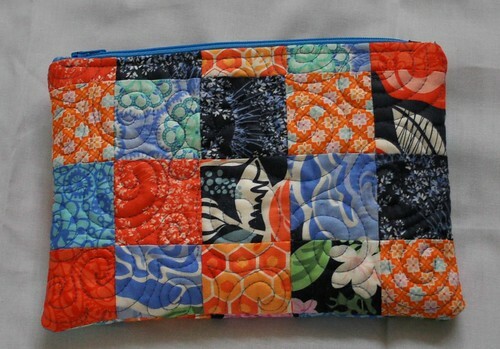 (I usually put my Janome on 4.2 for a 1/4" seam but for this project it needed to be on 4.0.) And then the weird thing for me was that after I sewed on the first arc to the melon, the narrow ends of those melon pieces had a little chunk slightly larger than 1/8" sticking out and I wasn't sure exactly what I was supposed to do with it. I looked at a couple videos specifically about this template but they didn't show the up close details, just the general construction information. Anyway, I made it work. I'm looking forward to getting the single arc template and trying another double wedding ring. 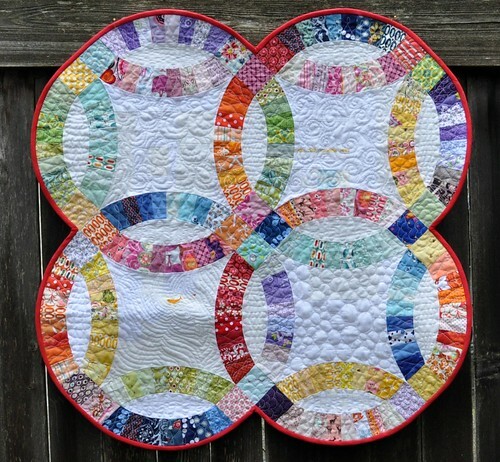 I quilted a different filler design in each of the four ring centers, flowers in the squares (not easy to see though), S-curves in the melons, and loopy zigzags in the arcs. 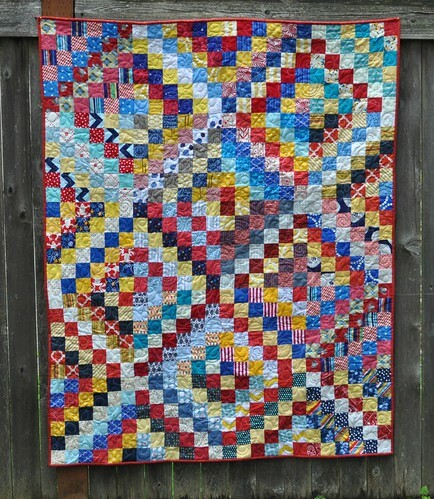 I had a hard time deciding on the binding but went with red because I thought it would look good and there is only one red arc in the quilt. And because I had red on hand. I got other good suggestions from friends--I think a dark purple or a black with a multicolor print would have looked great too. I got a little worried about the red after the binding was sewn on by machine but before I had it hand sewn down to the back--it was too much red and I thought I might need to redo the binding. 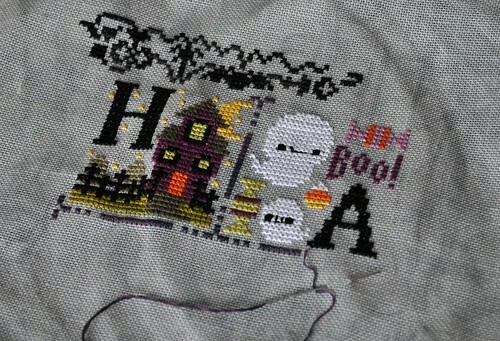 I kept going though and decided it looks a lot better sewn down than it did before that step was completed. 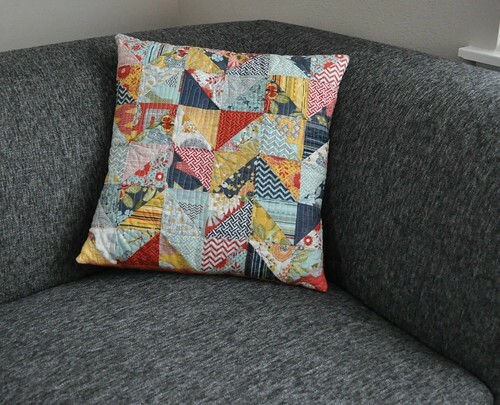 I made this pillow a couple weeks ago with half-square triangles cut from my PB&J layer cake. 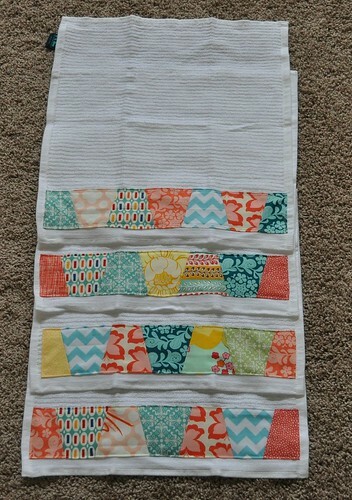 I was going for a zigzag look but the values in these fabrics didn't really work well for that. 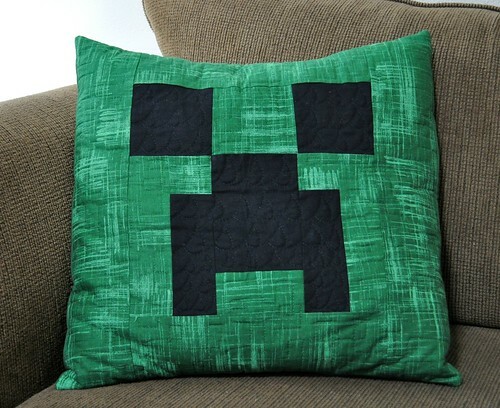 I still like the pillow though. So yesterday I decided to try again. This will be another pillow the same size as the first, but hopefully the design I am making with the triangles this time will show up better. 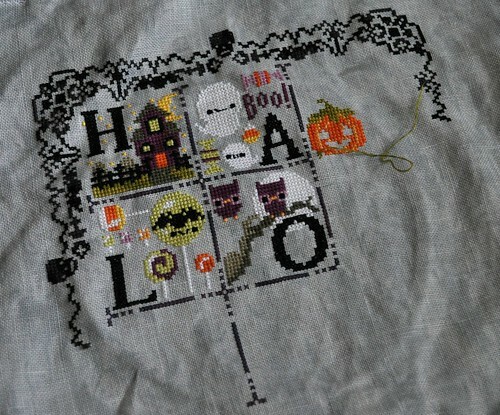 And if not, I am learning about value and how it works and how being limited to a fabric line can make a project like this a bit more challenging. 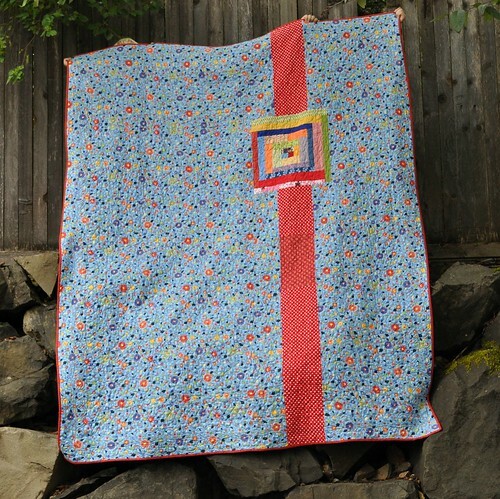 I finished up my Madrona Road log cabin wall-hanging quilt the other day. It's made with the scraps from my other Madrona Road project. 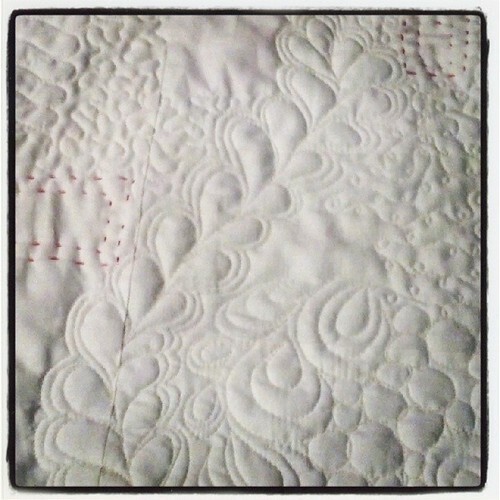 (That one's still not quilted yet.) I quilted some paisley/clam shells in the gray background. 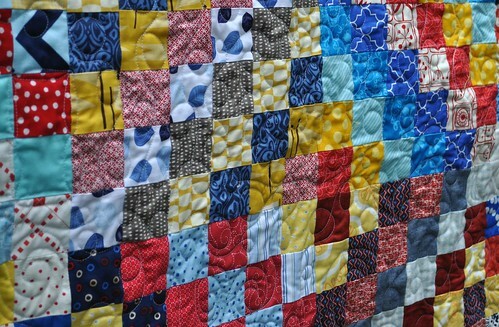 The thread's a little darker, I like how it makes the quilting stand out a little. 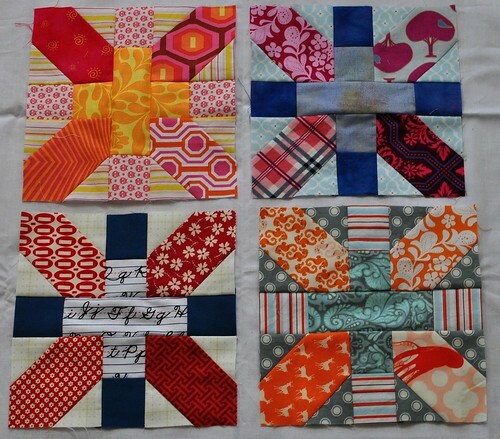 The log cabin blocks have different quilting in each round, done in off white thread. 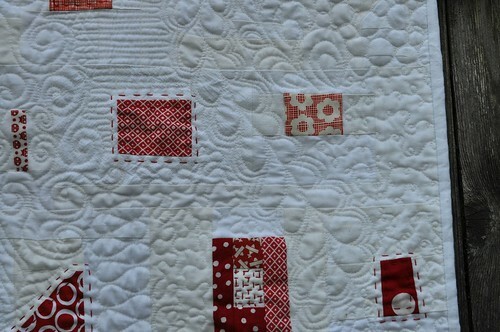 Maybe I should take a photo of the back so you can see the quilting. I didn't have a lot of the binding fabric so I went with a single fold binding this time. 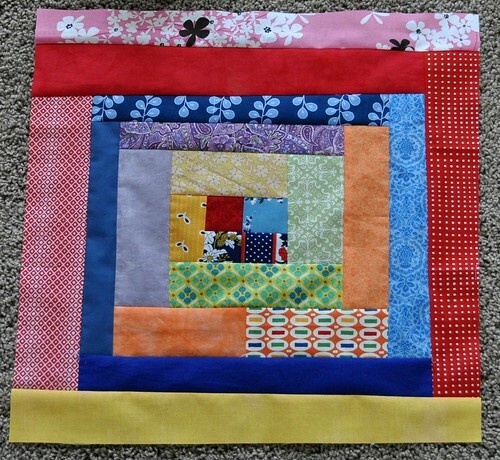 I think it turned out ok and is a good choice for a wall hanging or other mini quilt. 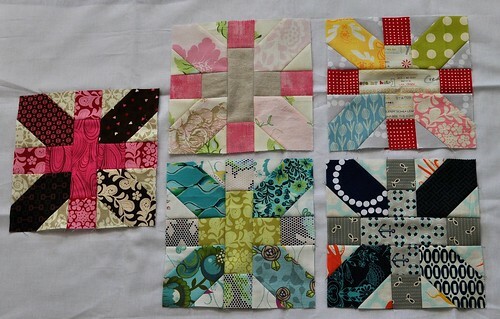 I've wanted to make an x plus quilt for quite a while and I started making my blocks last week. So far I've finished eight of them. 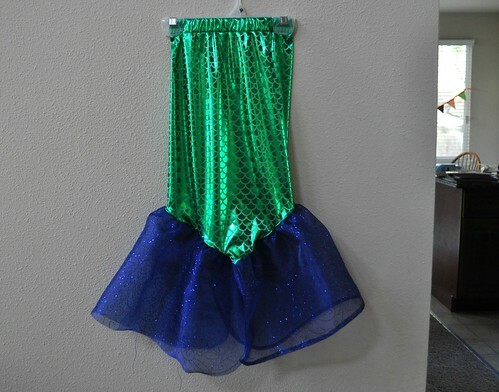 I am following the tutorial (and original measurements) on Badskirt Amy's blog. 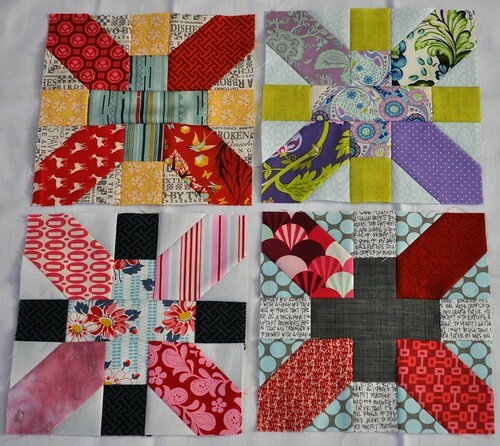 I made a couple of these blocks for a bee in a larger size, but I like the 8" block better. 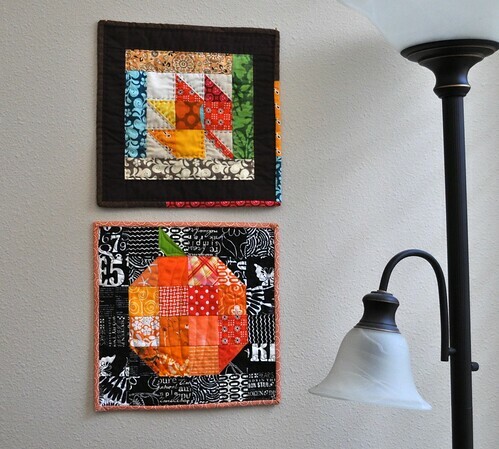 Also, I started a Pinterest board with my favorite x + quilts/projects, if you want to check that out. 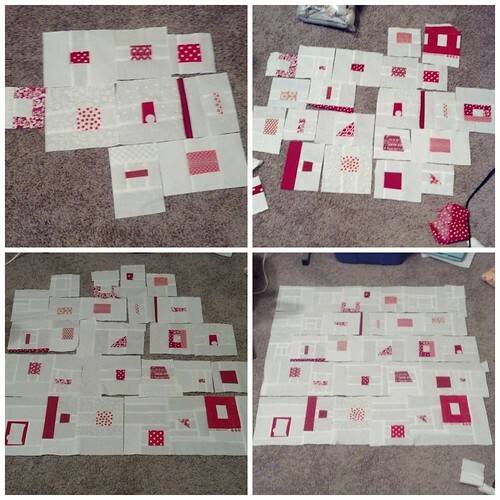 A few weeks ago, Modern Yardage contacted me and asked if I would make a project with some of their fabrics to share here on my blog. 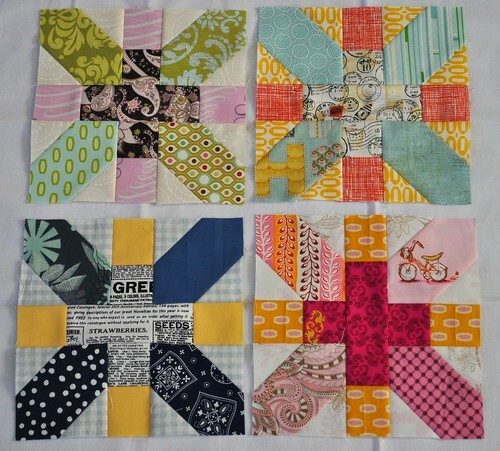 I decided I'd like to finally make a triangle one-patch quilt and asked for some fat quarters from the Personality line, by Emilie Daly. Here's how the fabric came. Eight fat quarters printed on one piece of fabric, with a little blurb about the fabric designer and some care instructions printed in that extra spot on the bottom right. Pretty cool. 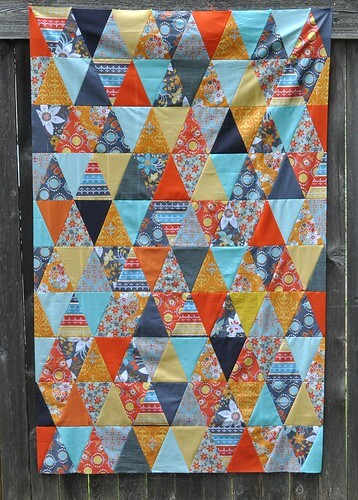 If you haven't heard about Modern Yardage already, they are a new fabric company that digitally prints their fabrics. You can browse their fabric lines and then choose the scale of your print when you order. In the photo above, the blue and yellow prints on the top row are the same design (different colors, obviously) but I ordered the blue in the smallest size and the yellow in the largest. 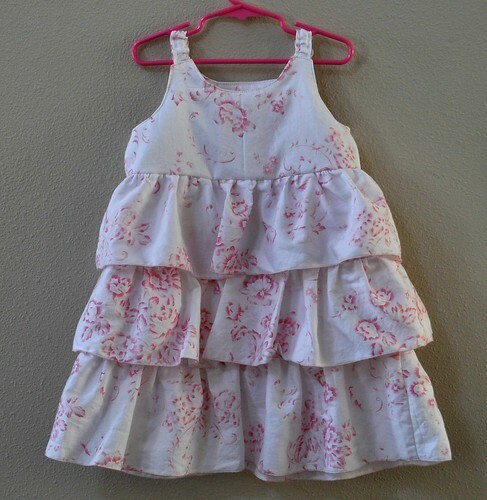 "We use the additional 14” of fabric to offer fun and creative value-added items. For example, on one order you might find a message from the designer of the print you purchased. On another order you might find an inspirational craft idea or simple sewing pattern. 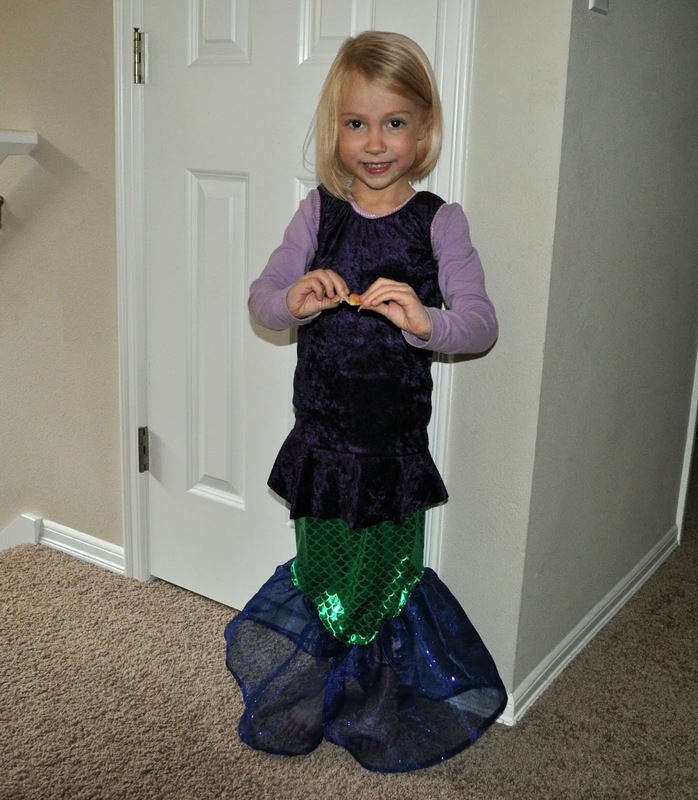 On another order you may find a coupon for your next purchase or pictures of us making fabric. It will always be a surprise!" 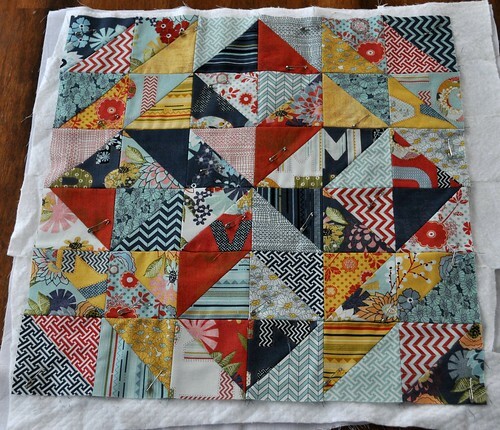 For my quilt, I decided to add in some solid fabrics (some Kona cotton and some unknown solids I had on hand) to help calm all the prints down, and I finished up the quilt top last night. 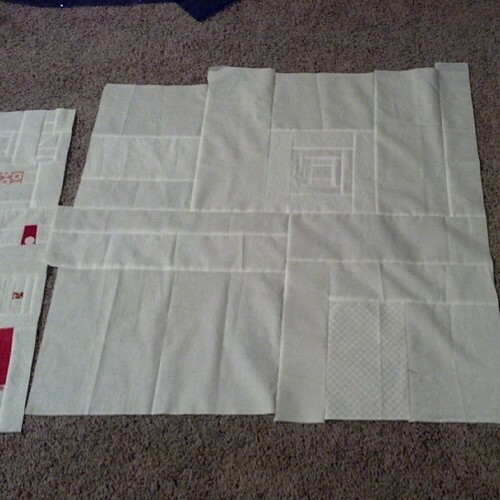 I didn't follow a pattern, just laid it out and sewed. 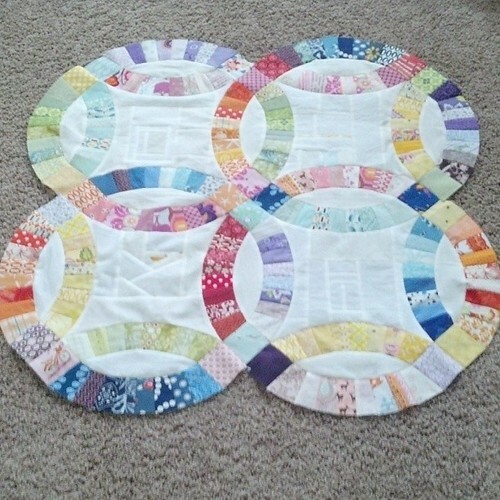 It's kind of a baby/toddler size quilt and if I make another one I'd probably make it one row wider and one row shorter. 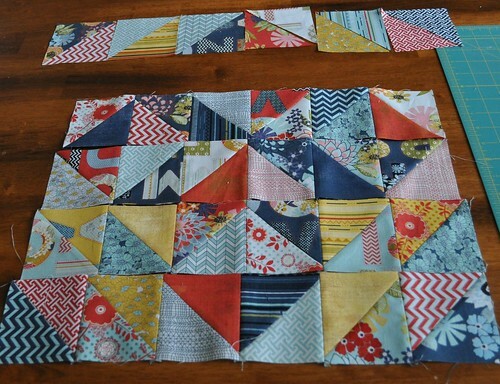 I used my Simpli-EZ 45 degree triangle template to cut the triangles. To sum up: I think the idea behind Modern Yardage is pretty cool (environmentally friendly, printed in the US) and they have some great fabric designs with more being added all the time. 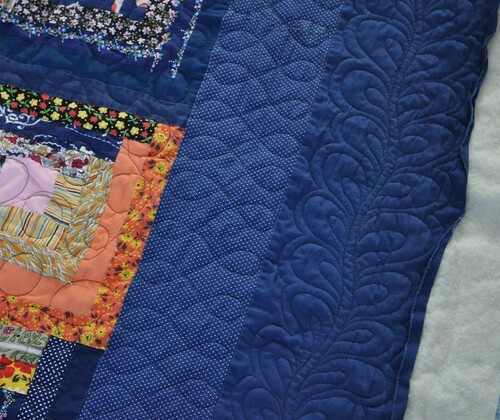 Their fabric seems good quality and is just slightly heavier than most traditional quilt shop quilting fabric. 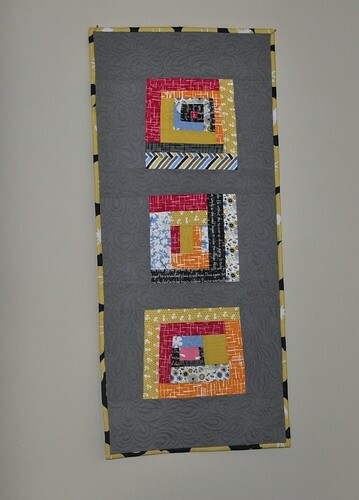 Disclosure: Modern Yardage gave me the printed fabric used in this project. We got back from our Utah vacation late last Friday. We were there about a week and we had a wonderful, busy time. We met two nieces we hadn't seen before and spent a lot of time with my family and my husband's family. We also saw friends from Kansas that we haven't seen for almost two years; I'm so glad it worked out and we were in Utah the same time as they were. We went to the water park and splash pad and had Gandalfo's and Cafe Rio, and my in-laws made delicious German food too. It was so nice but also exhausting and we were glad to get home and try to get back to normal for a couple weeks. 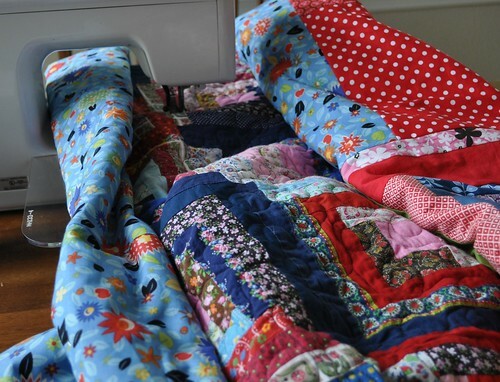 My mom got a new longarm recently and I quilted my scrappy trips quilt on it. 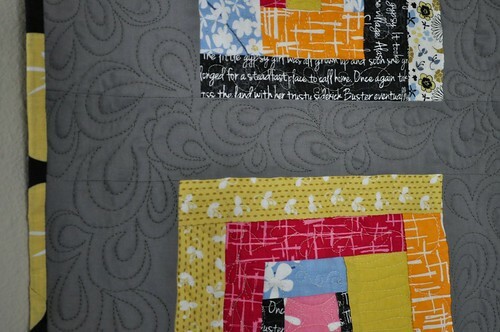 I am working to finish up Jan's quilt as well. 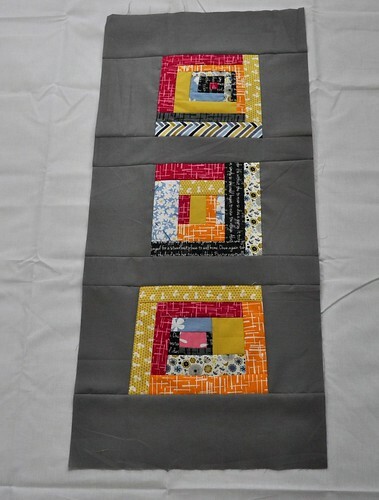 Today I finished quilting the inner border and started the outer border. 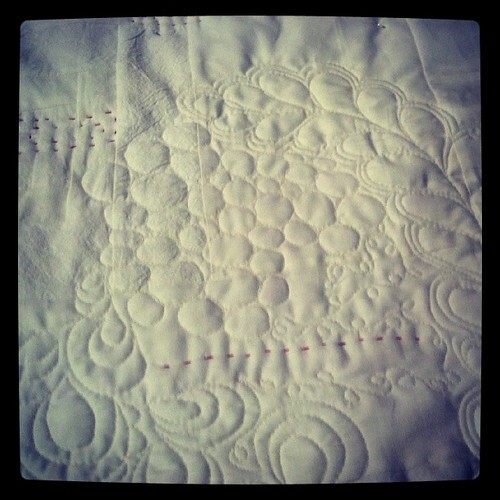 I'm doing a double feather again, with a row of echo stitching around it to help fill in the space. 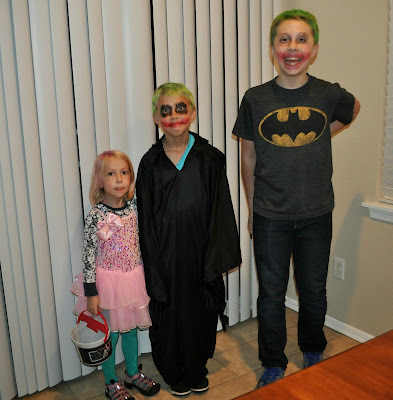 My boys have been out of school for just 2 1/2 weeks and summer has been really busy so far, with lots of transitions. My oldest was at scout camp all last week and this week has been busy with July 4th stuff and family activities (pool, zoo, dutch oven cake making, oh and chores for all). Everybody got through the 4th safe and sound this year, I'm happy to report. 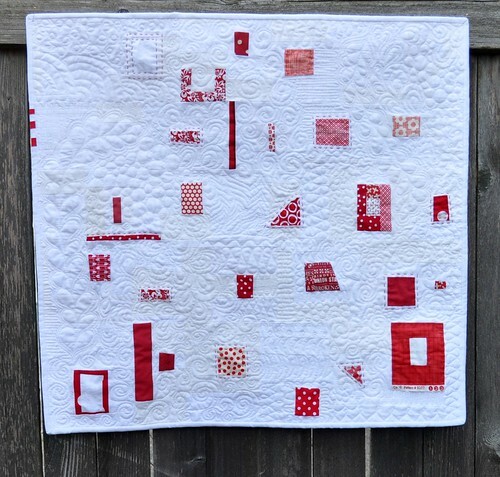 I spent some time (when I had a few minutes for my brain to focus) working on a project/article for the next issue of Modern Patchwork; it will be fun to see my work in print again. 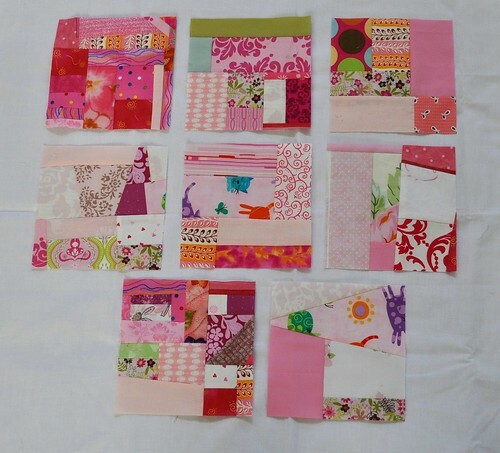 I have a working list of ongoing projects too... but decided to get out my Neptune fabric and make some 9-patches. I ended up with 20 of them. 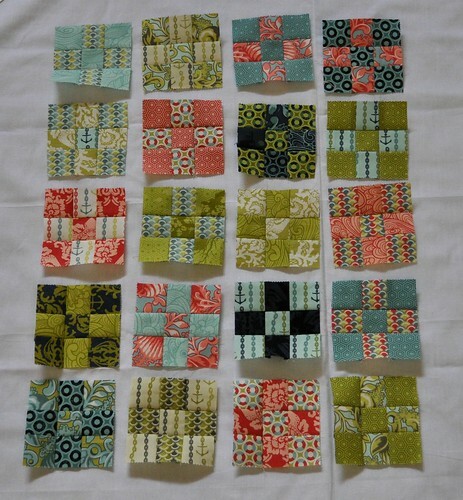 I have more fabric but not a very big variety any more so I decided to stop here and keep the blocks different and interesting. 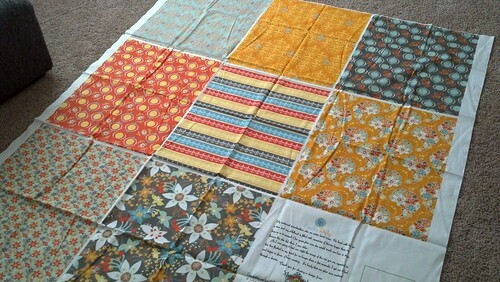 I'm going to get some light aqua sashing/border fabric and do something with a row of squares for a border, too.